The most recent Lawrence County native to attain the rank of Brigadier General is also the County’s first woman to do so. Marilyn Chiafullo was born in New Castle, Pennsylvania, to Joseph H. and Florence (Zarella) Chiafullo, both deceased. Her siblings include her twin Maureen K. Chiafullo-Haid of New Castle, Carol A. (deceased), Joseph R. (deceased), David R. of New Castle and James D. of Pittsburgh. Chiafullo graduated from Union High School in 1979 and received her Bachelor of Science in Education from Slippery Rock University in 1983. She spent three years as a junior high school teacher and coach at Cotulla Independent School District, Cotulla, Texas. In 1990, she was commissioned in the Quartermaster Corps following Officer Candidate School. A member of the Army Judge Advocate General’s Corps (JAG) since 1993, Chiafullo most recently served as the full time Chief of Staff for the U. S. Army Reserve Legal Command. Her prior assignments include Staff Judge Advocate, Division West, First Army, Fort Hood, Texas; Senior Defense Counsel, 154th Legal Support Organization; Chief, Administrative and Civil Law Division, 99th Regional Support Command (RSC); Assistant Chief, Criminal Law, 99th RSC; Trial Defense Counsel (TDS), 82nd Airborne Division; Chief, Legal Assistance/Claims and Federal Magistrate’s Court Prosecutor, Fort Ritchie, Maryland; Platoon Leader and Executive Officer, 475th Quartermaster Company, Beaver Falls, Pennsylvania. Chiafullo received her law degree from Duquesne University School of Law in 1993. She was mobilized in support of Operation Noble Eagle as a Senior Defense Counsel to serve with the 82nd Airborne Division. She deployed as Senior Defense Counsel in support of Operation Enduring Freedom to Karshi-Kanabas, Uzbekistan and Bagram Airfield, Afghanistan. Brigadier General Chiafullo is admitted to practice law before the Supreme Court of Pennsylvania and the U. S. District Court, Western District of Pennsylvania. 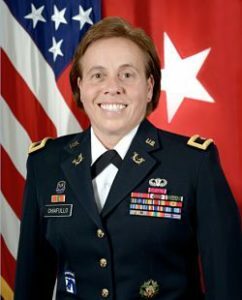 Chiafullo currently serves as the full time Chief of Staff for the U.S. Army Reserve Legal Command. The command provides the Army with trained, committed and professional legal forces in furtherance of global military operations. Col. Chiafullo was promoted to Brigadier General on October 3, 2016 in Arlington, VA. The first woman ever to wear the stars of a general officer in the U. S. Armed Forces was Anna Mae Hays, who was nominated for the position by President Richard M. Nixon in 1970.